322 pages | 20 B/W Illus. Climate change is at the forefront of ideas about public policy, the economy and labour issues. However, the gendered dimensions of climate change and the public policy issues associated with it in wealthy nations are much less understood. 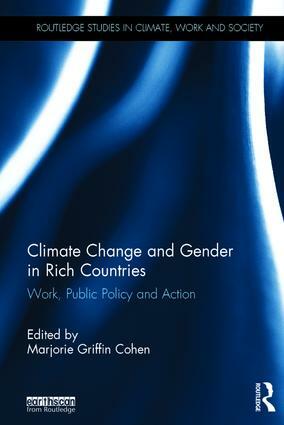 Climate Change and Gender in Rich Countries covers a wide range of issues dealing with work and working life. The book demonstrates the gendered distinctions in both experiences of climate change and the ways that public policy deals with it. The book draws on case studies from the UK, Sweden, Australia, Canada, Spain and the US to address key issues such as: how gendered distinctions affect the most vulnerable; paid and unpaid work; and activism on climate change. It is argued that including gender as part of the analysis will lead to more equitable and stronger societies as solutions to climate change advance. This volume will be of great relevance to students, scholars, trade unionists and international organisations with an interest in climate change, gender, public policy and environmental studies. "An exciting collection of top scholars comes together in this path-breaking book to decipher the collision of two of today’s hottest political topics: gender and climate change. It reveals how this massive problem of climate change is better tackled when gender forms the centre of policy solutions." – Kennedy Stewart, MP, Opposition Science Critic, New Democratic Party, Parliament of Canada. Marjorie Griffin Cohen is an economist and a Professor Emeritus of Political Science and Gender, Sexuality and Women’s Studies at Simon Fraser University, Canada. Globally, the world is browning, not greening. In 2010 greenhouse gas emissions rose 5.9%, the largest annual increase since measurement began. In 2013 the earth’s atmosphere crossed the dangerous threshold of 400 parts per million of carbon dioxide in the atmosphere. The complexity, destructiveness and speed of changes to the climate have made global warming an urgent social issue. It is a challenge the world cannot ignore. Climate change has already shaken up the nature of work and the distribution of employment within and between countries, regions and communities. It is changing how we work, what we produce, and where we can produce it. It disrupts the lives of workers and the global supply chains of transnational corporations, undermines governments and creates a new class of precarity—climate migrants. But at the same time as global warming destroys livelihoods and communities, it is forcing the emergence of new ways to organise work. Climate-related occupations and professions are defensively springing up, and trade unions and farmers’ unions in some countries are factoring environmental stewardship into their 21st century responsibilities as custodians of decent work for the next generations. The world of work is a crucial, although neglected, part of the climate struggle. Work and workplaces of every size—factories, offices and mines, farms, schools, hospitals and home offices—are significant producers of greenhouse gas emissions. In developed countries, work can produce 80% or more of the greenhouse gases created by human activity. Polluters yes, but can workers and unions also be powerful actors in the struggle to slow global warming? In The Routledge Studies in Climate, Work and Society series, scholars and other thinkers at the forefront of constructing a strategic link between work and climate change contribute to identifying the issues, evaluating policies and silences, tracking change, and stimulating international exchange of ideas and experience. Collectively, the books in this series will emphasise fresh thinking, strategic creativity, international and inter-sectoral comparisons and contribute to the further development of the role of work in societal responses to global warming.